A few day ago I got an email about a little girl who lives in Nebraska named Mariah. Mariah is 7 months old and has a very rare brain disorder called Schizencephaly. It is commonly called Split Brain, and basically it prevents her brain from communicating within itself. It can affect one of both sides, and for Mariah it affects both. She has been on trial drugs that were helping to control the terrible seizures she has, but those have stopped working. She has been traveling to the Mayo clinic in MN for treatment, leaving her dad and three sisters at home. The woman who sent the email works with Mariah’s grandfather, and they are putting together a charity auction to try and help with the medical bills. I sent this quilt to my friend to be auctioned off. It is made entirely from my scrapbox, and came together pretty quickly. I have named it Alisa Sue after two incredible women I know who are an inspiration. They are both such a positive force in the world. They are beautiful, full of faith and hope, and a lot of my very first scraps (plenty of which are in this quilt) came from them. This is my first time doing the binding all by machine (I didn’t have time to do it by hand) and I only had to pick out about 30 inches, which I think of as pretty successful! I hope the auction can raise a little money for this family. I think it is such a great idea. When we all pull together for a common cause and help each other out we can make this world a little better place for everyone. I am adding this it Sew&Tell at Amy’s. Happy Friday! What a great finish! Hope it raises lots of money! 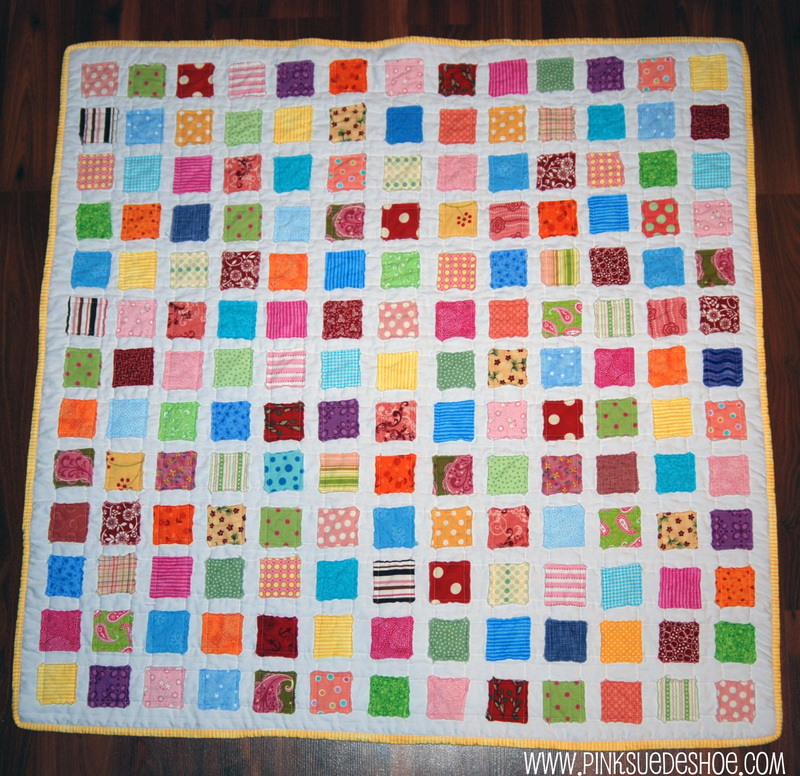 A sweet little quilt for such a good cause – thanks for sharing! what a great quilt for a great cause! I hope it fetches a great price to match! You are awsome for helping out with this. Great quilt and so sweet of you to donate it to be auctioned for this great cause. 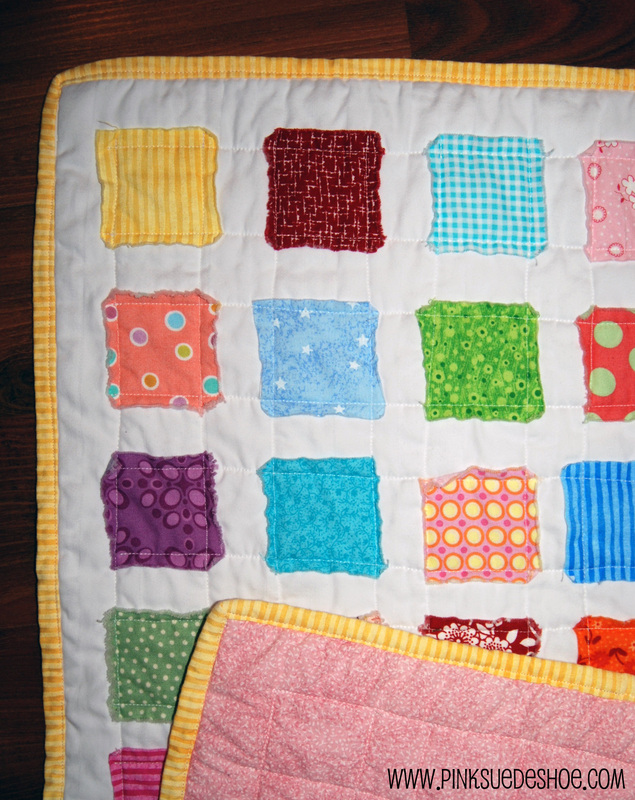 I pray this precious quilt raises a TON of money! You definitely win the “Biggest Heart ” for this Friday’s Finishes. I’m truly humbled by your generosity and thoughtfulness in doing something to help! this is gorgeous!! and for such a great cause…sweet little girl. Super cute quilt!! And what a great thing to be a part of. How very generous. I loved checking out all the bits of fabric to see if I had any the same. You just blessed that little girl in BIG BIG ways!! What a darling quilt. That is so generous of you and it is a beautiful quilt. I bet it will raise a lot of money in the auction. The binding looks great! Love this happy little quilt. It is so fun to look at all the different fabrics. Jealous you got to go to St. George. My mom and dad live there. I love to visit. At least Sep. through May. What a beautiful quilt! I hope it raised a lot of money for this little girl. I like how you named this quilt. The fabrics are so happy and cheerful! I just found out that this quilt was sold at the auction for $95 and I couldn’t be happier!